I first encountered the work of writer, professor and editor Roxane Gay in a college English class. We were reading excerpts from her short story collection, Difficult Women, in which Gay discourages her readers’ tendency to find “likability” in the female characters they read about. Since then, I’ve read articles about Gay; made note of her novels in the syllabus section of bookstores; and even seen Instagram stories from social media influencers picturing her essay collection, Bad Feminist, placed alongside hip, healthy drink. In short, she’s part of the national conversation. For those unfamiliar with Gay, her body of work includes both fiction and nonfiction, with a voice that uses social commentary to parse through daily problems. She crafts stories that are closely related to her life as a woman of color, and writes candid essays discussing formative experiences and opinions she holds. She’s published frequently in The New York Times, edits essays for magazines and literary collectives and has been a recipient of the Guggenheim Fellowship for Creative Arts. Needless to say, she’s a pretty big deal. Such a big deal, in fact, that I was shocked to learn that Gay was coming to speak in Saratoga Springs—and by some stroke of luck, at Skidmore College’s Arthur Zankel Music Center on Friday, January 25. I made sure I was there. After being introduced by multiple students and professors, Gay marched in wearing a simple shirt and jeans and sat on a couch onstage. This first visual was indicative of Gay’s persona: blunt and unapologetic. 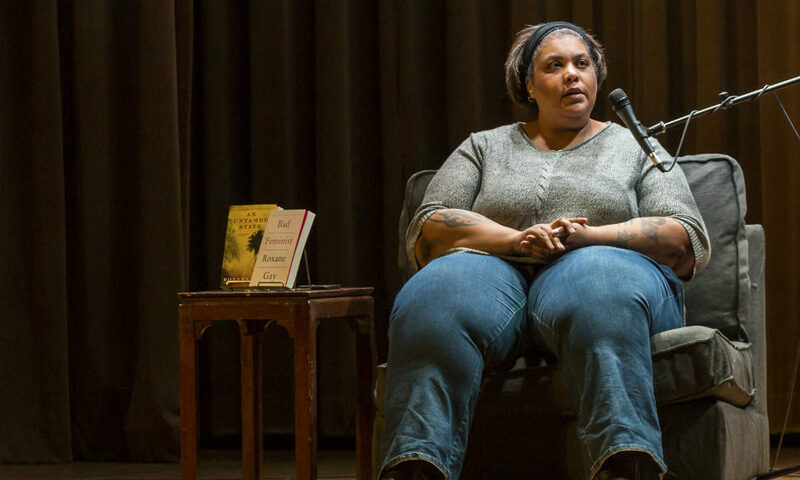 She began by cursing Saratoga’s weather, which was met with begrudging laughter throughout the auditorium, and went on to read a handful of excerpts from her memoir, Hunger: A Memoir of (My) Body. The book, which hit shelves two years ago, is about Gay’s relationship with food and her body, and how that’s changed in the wake of sexual trauma and her changing conception of identity. She read an excerpt on exercise that was wrought with dry hilarity. In it, she jokes about how she loves to complain about exercise and hates being told what to do, which, for her, always culminates in the question, “Do personal trainers deserve to die?” Next, she read an ode to the Food Network, specifically, Barefoot Contessa’s Ina Garten. Amidst jokes detailing how profound her love for Garten is, Gay thanked the TV food personality for giving her permission to love food, which Gay sees as getting permission to take care of herself. The final story of the night took on a decidedly more serious tone, when Gay spoke about the distance between herself and the man who had raped her. She discussed using hunger to recover from the trauma and food as a means of comfort. She also talked about gaining weight in order to protect herself from her assailant ever recognizing her in public. Gay has since discovered that her assailant is an executive at a major company and admitted to the audience that she’d looked him up frequently online, and occasionally, called his office—but never spoke to him when he answered, only breathed into the phone, wondering if he suspected that it was her on the other end of the line. Gay summed up her work, perspective and life in a carefully articulated response to an audience member’s question asking how she had overcome obstacles and maintained success through adversity. “I’ve never met a door that I feared running all the way through,” Gay responded. (1) To parents: Let your children know they will be loved even if they make mistakes. (2) To young feminists and activists: Keep your feminism inclusive and intersectional. The best way to make a difference is by volunteering your work and time. (3) To those who know people recovering from sexual trauma: Women tend to minimize their traumas. The best way to help them is by loving them unconditionally. (4) To all young women: Be OK with displeasing people. Take ownership of your body, even though this might make the world angry. (5) To young women of color: You don’t need to have trauma to have recognition. You don’t need to use your trauma to be respected.